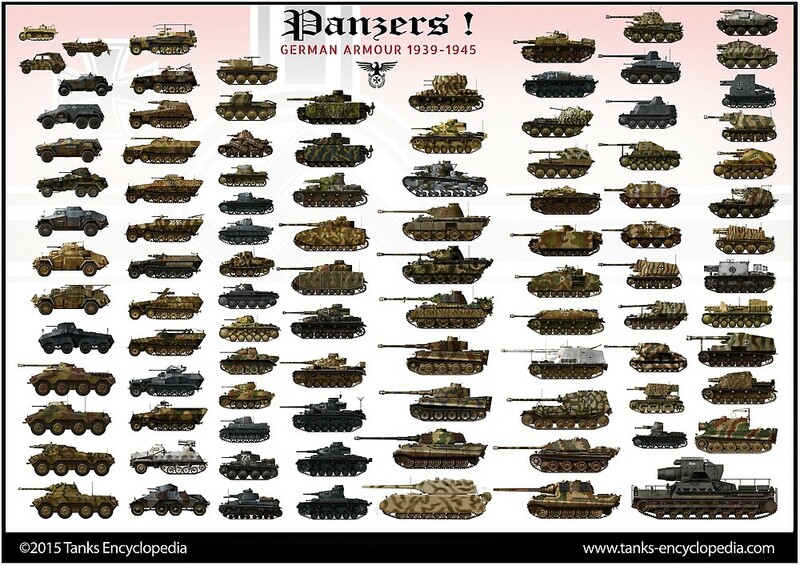 In 1929, the Reichswehr, the regular German army, under the rule of the Versailles treaty, was forbidden from having tanks. Armored cars were allowed, but only for police purposes, and later for the army itself, although in limited armament and quantities. Until then, exercises were often performed with dummy tanks mounted on regular cars. WW1 armored cars, like the Ehrhart and others, were still in service. Nevertheless, the first interwar “official” armored vehicle specifications called for a light scout car. Adler proposed its own design, based on the sturdy chassis of the successful commercial model, “Standard-6”. 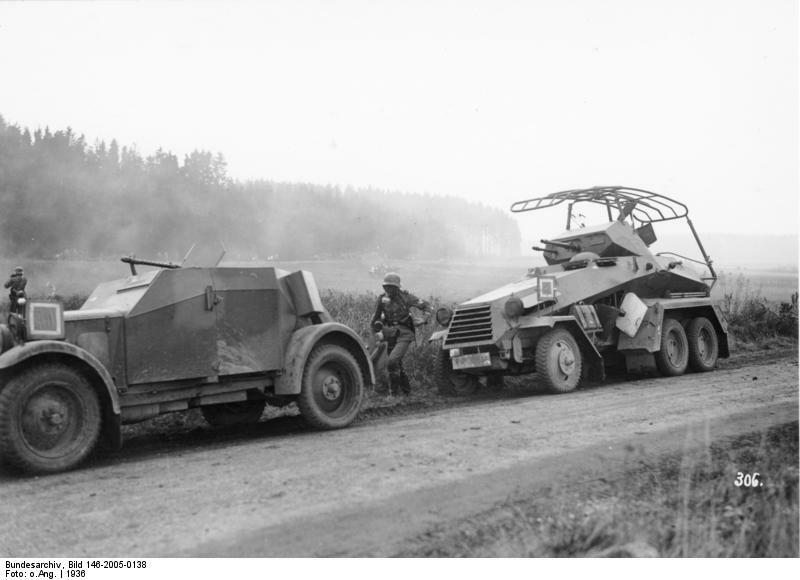 The vehicle was known as the Panzerspähwagen Kfz.13 (scout armored car). Adlerwerke, based in Frankfurt-on-Main, chose to use a framework wrapped in armor plates, to create an armored hull with sloped sides for better bullet deflection. This quick solution was rendered possible by the way cars were made at that time, especially for luxury brand ones. The chassis was factory-built and then turned over to specialized bodybuilders and coach builders for the bodywork. 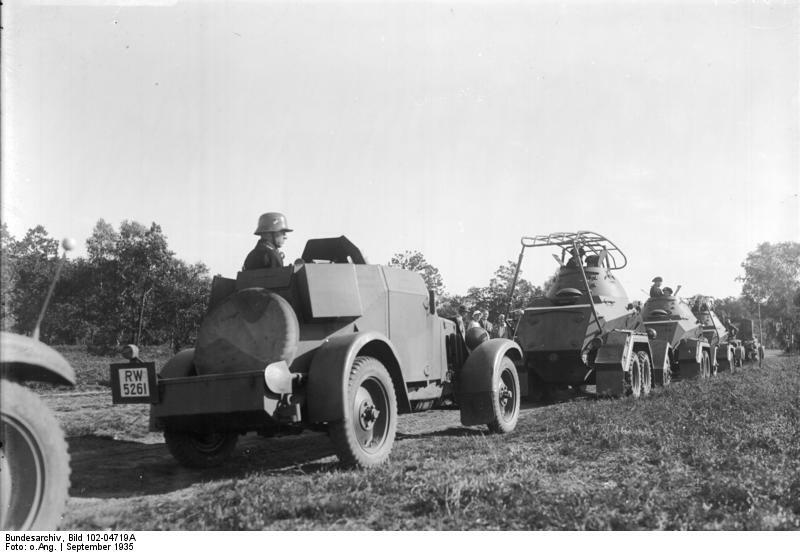 Yet, by the standards of 1931, the Kfz.13 (the Waffenamt designation was later changed to Sd.Kfz.13, “special purpose vehicle”) received a welded hull, a technology already mastered by Adler. This proved less time-consuming and made for a lighter body. However, the light protection was only capable of stopping infantry small arms fire. Moreover, for better visibility and strength, the body was of a “bath-tub” style, with no access doors and completely open top. This left the crew unprotected against shrapnel. The Standard-6 engine was a water cooled, 2.916 cm³. It was equipped with a four-wheel drive for off-road rides. 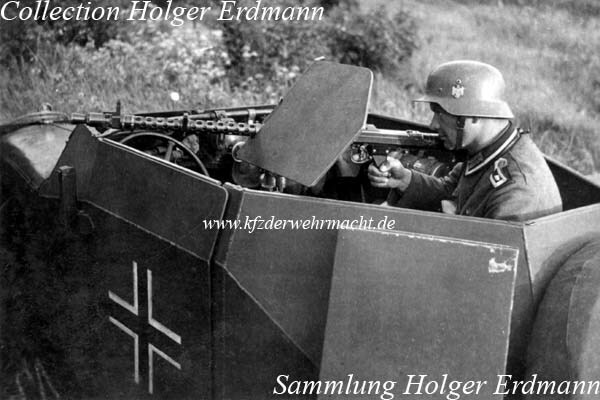 The early MG 13 machine-gun was protected by a short, sloped shield. The driver has a single vision slit, but there was no other aperture in the hull. During trials, the vehicle proved satisfactory, but it later turned out to have a bad ride on average grounds, and was more or less relegated to work on roads and flat terrains. In all, 147 vehicles left the factory until 1935. There was no evolution during production, although the original MG 13 machine-gun was replaced by the new MG 34. A few models later received a vertical sloped extension and armored roof, with a large access hatch. 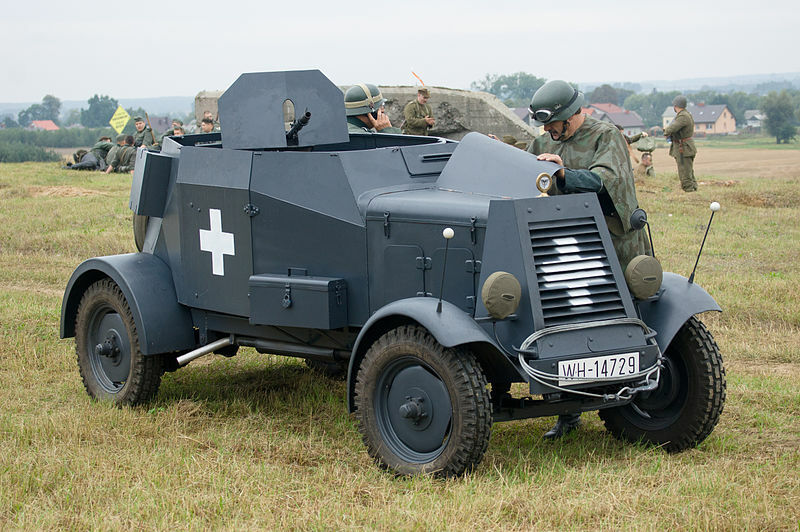 The unarmed version, Funkkraftwagen (Kfz. 14), was fitted with a large bed-frame antenna and long range radio device. 40 were built in parallel to the regular model. 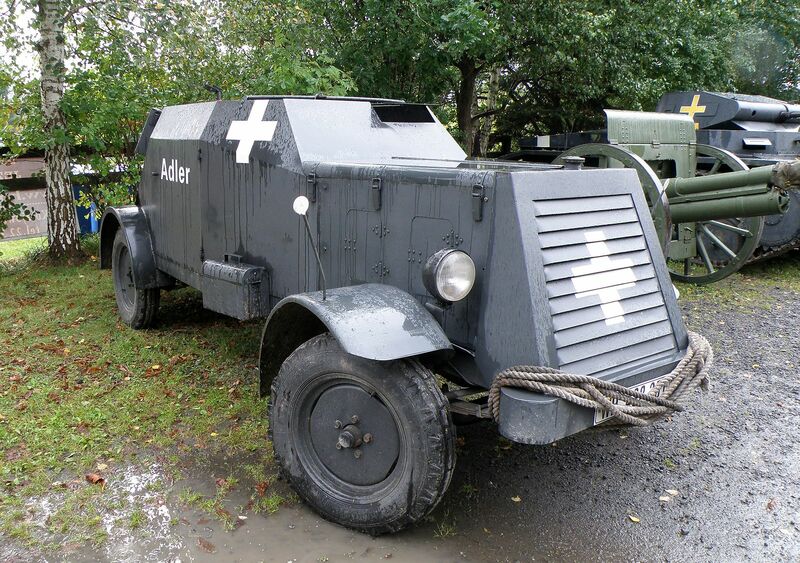 Until 1933, the Adler Kfz.13 was largely used by the Werhmarcht in large-scale exercises. It was used in the campaign in Poland and in the Western campaign in 1940. By 1941, they were retired from active service, and only used for training purposes, since new models appeared with better off-road capabilities, protection and armament. 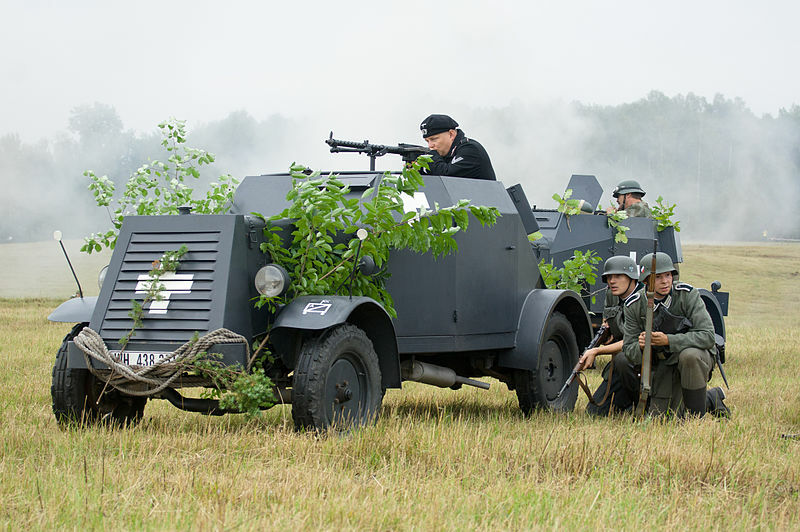 Kfz.13, in prewar tri-tone livery, 1936 Werhmacht large scale exercises. Adler Sd.Kfz.13 prior to the Polish invasion, in dunkergrau livery. Notice the simplified white Balkan cross, an obvious target. Sd.Kfz.13 “Leopard”, Poland, September 1939. Sd.Kfz. 13, 1st Kav, 24th Panzer Division, France, May 1940. Sd.Kfz.14 command car, Balkans, March 1941. Nice vehicle. Maybe the Germans should have used it as an armored jeep.